Earlier this year, Kaiser Permanente awarded Walk and Wheel grants to 10 city governments and 10 employers along the Front Range to help them plan and implement programs—and in some cases, physical projects—that give people healthy choices in getting where they need to go. Bicycle Colorado started work helping these governments and employers with their projects by providing technical assistance, ranging from evaluating current policies to teaching flat-tire changing clinics at work sites. The active transportation movement aims to give people easier and safer ways to walk, bike or take transit by improving regulations and policies, building safer infrastructure and creating programs that encourage people to bike and walk. Doing a baseline assessment of policies, regulations, existing and planned infrastructure, programs and events and community/employee attitudes regarding active transportation. Developing action plans that include strategies, timelines and evaluation plans. Guiding and empowering these groups to implement the plans now and over the long-term. 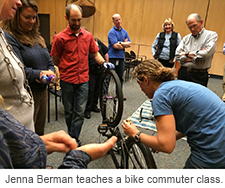 Teaching employees to change flat tires (which is one obstacle to people using bicycles to commute or run errands). Giving participants tools to begin bike commuting and participate in walking groups. Encouraging participants to track their use of active transportation. Ted Heyd, our regional policy director, and Jenna Berman, our education director, are the leads on the technical assistance projects. Ted knows government transportation funding inside and out, and Jenna has designed and led many workplace education programs through our Bicycle Commuter Services program. 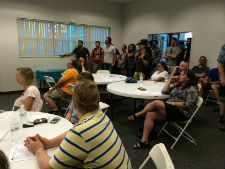 In July, representatives from Bicycle Colorado and Fox Tuttle Hernandez Transportation Group spent a day with City of Pueblo staff and advocates to examine current constraints and future opportunities to improve bicycling and walking. More recently, Ted Heyd and Jenna Berman of Bicycle Colorado and Carlos Hernandez of Fox Tuttle Hernandez returned to Pueblo and met with city staff and a community advocate to identify the location for a two-way cycle track demonstration project through downtown. The project will better connect neighborhoods east of I-25 to downtown via a protected bikeway with bike-specific signals at key intersections. The Pueblo City-County Health Department is working to improve employee health by instituting a bike library for employees and hosting bike commuting classes. They are also pursuing an innovative workplace idea—implementing a mileage reimbursement program for walking and biking to meetings. Bicycle Colorado is working with the Health Department’s wellness team to come up with strategies to promote their fall walking and biking challenge and will be teaching a commuter education class to all employees on August 18. 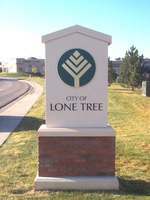 Lone Tree is a city on the move. Recognizing increased demand from residents and employees to get around by foot or bicycle, the city applied for and was the recipient of a Kaiser Permanente Walk and Wheel grant, which helps to design safer, healthier and more accessible transportation options. Lone Tree is one of 11 Colorado communities selected in which Bicycle Colorado provides technical assistance and support. The city recently hired a transportation consulting firm to complete a bike/pedestrian mobility study. “People want Lone Tree to be a bike- and pedestrian-friendly place to live and work, and this grant will identify ways to improve how bikes and people move throughout our community,” says Mayor Pro Tem Jackie Millet. Want to get involved? Lone Tree residents and other stakeholders will have opportunities to share their thoughts through outreach at summer concert events. To be notified of project updates and community meetings, send an email request to walkandwheel@cityoflonetree.com. As part of the Walk and Wheel work sponsored by Kaiser Permanente, Bicycle Colorado’s Jenna Berman and Ted Heyd recently spent a day in Pueblo meeting with City of Pueblo and CDOT staff as well as local community members. Inspired by the mission of the Walk and Wheel grant to get more people biking and walking, the day-long event was called “See Bikes and People Everywhere.” After a tour of Pueblo, our staff and Carlos Hernandez of Boulder’s Fox Tuttle Transportation Group provided bicycle and pedestrian infrastructure and advocacy expertise to Pueblo stakeholders. Colorado bicycle commuting: How much do you know?